If you have one or more events where contacts must purchase a pass, then your contacts will probably appreciate being able to pay for their passes online while they are registering for the event on your event website. To enable online payment, you must make an agreement with a third-party payment provider who can authenticate and capture payment details. Your payment provider will supply you with details about how to implement their system, which you'll usually do by adding code supplied by your provider to a web page running on your event website. You'll typically also need to tell your provider the URL to request from Dynamics 365 for Marketing to indicate a successful payment. Once your new payment gateway is in place on your event website, you can configure your various events to use it, or assign it as the default for all new events. 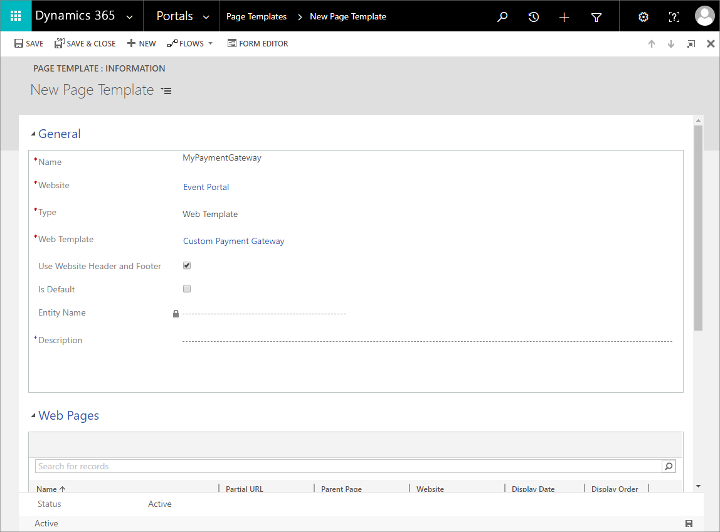 If you are hosting the event website on a Dynamics 365 for Customer Engagement portal, then see Create a payment gateway when hosting on the Dynamics 365 portal for instructions. If you are hosting the event website on an external server, then see Create a payment gateway when hosting on an external site for instructions. Make an agreement with a third-party payment provider and prepare a web page that provides a payment front end, as described in their documentation. 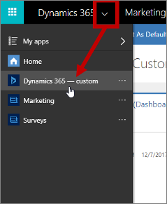 Sign in to Dynamics 365 and go to the custom app by choosing Dynamics 365—custom from the app selector. In the custom app, use the horizontal navigator at the top of the page to open Portals > Content > Web Templates. Select + New on the control bar to create a new web template. Enter a Name for your template and set the Website to the Event Portal. Then paste the web-page code you developed for the gateway into the Source field. Save your template by selecting the Save button at the bottom-right corner of the window. Go to Portals > Website > Page Template and select + New on the command bar to create a new page template. Name: Enter a name for your page template. Website: Select the Event Portal. Type: Set to Web Template. Web Template: Select the web template that you created earlier in this procedure. Go to Portals > Content > Web Pages and select + New on the command bar to create a new web page. Name: Enter a name for your web page. Partial URL: Enter a folder name that you want to show in the URL path for this page. This text must form part of a valid URL, so use only letters, numbers, hyphens, and underscores (avoid spaces, special characters, invalid URL characters, and slashes). This value becomes part of the page URL using the following pattern: https://<YourPortalDomain>/<PartialURL>/. Page Template: Select the page template that you created earlier in this procedure. Publishing State: Set to Published. Save your page. Your new payment gateway is now available to your event website. In the Marketing app, go to Events > Event > Events to open the events list. Find and open an existing event or create a new one. On the General tab of the Event form, scroll down to the Website section and select your payment gateway page in the Portal payment gateway field. Restart your portal or refresh its server cache to make sure your new setting takes effect right away. For instructions, see How can I fix occasional portal issues?. For details about how to develop the system for receiving payment and finalizing registrations, see Develop a system to finalize event registration later in this topic. If you are hosting the event website on your own web server, then you must download and customize the event website to include the payment option as needed. Your payment provider will give you the instructions you need to interact with their system. For more information about how to download the latest version of the event website, customize it, build it, and then deploy it on a Dynamics 365 for Customer Engagement portal or external website, see Build and host a custom event website. When you are hosting on an external site, the Payment gateway and Allow anonymous registration settings for the event record have no effect. You can implement these preferences by customizing the site directly. 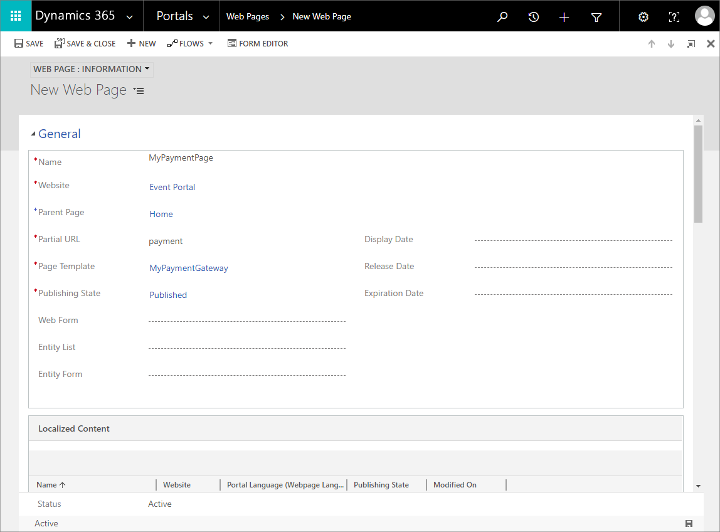 Dynamics 365 for Marketing creates a temporary event registration, associates it with the current browser session, and then opens a page that links or redirects to your payment provider and forwards the payment details. The system waits for the payment provider to confirm payment by calling the success URL operated by Dynamics 365 for Marketing. When you sign up with a payment provider, they will usually ask for this success URL and use it in the code they return to you to include on your payment page. 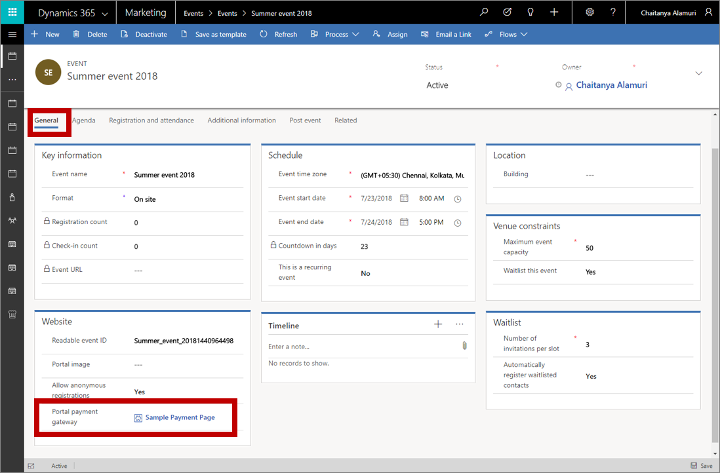 When Dynamics 365 for Marketing receives the success-URL request, it finalizes the registration by turning the temporary registration into an actual registration that users can see in the system. To set up the success URL, you must create a back-end service that is triggered when your payment provider calls that URL. You'll probably need assistance from a developer to create this service. You (or your developer) can use any implementation technology you like to create it. Depending on your payment provider, your back-end service may also be able to apply additional checks to the transaction. This isn't strictly required to finalize the registration, but it is good practice. If you need additional purchase details to verify the transaction, you can get the data by executing the custom action msevtmgt_GetPurchaseDetailsAction. It expects the input parameter PurchaseId, which is the ID of the temporary event registration. The output result of this custom action returns the event name, purchase amount, currency name, ISO currency code, and currency symbol. PurchaseId: The ID of the temporary event registration that was generated after the contact submitted their registration and payment details. ReadableEventId: A value that uniquely identifies the event. One way that you can see this is by opening the relevant event record, going to the General tab and finding the Readable event ID field. UserId: Identifies the contact who made the purchase. This is the ID for the contact record in Dynamics 365 for Customer Engagement. 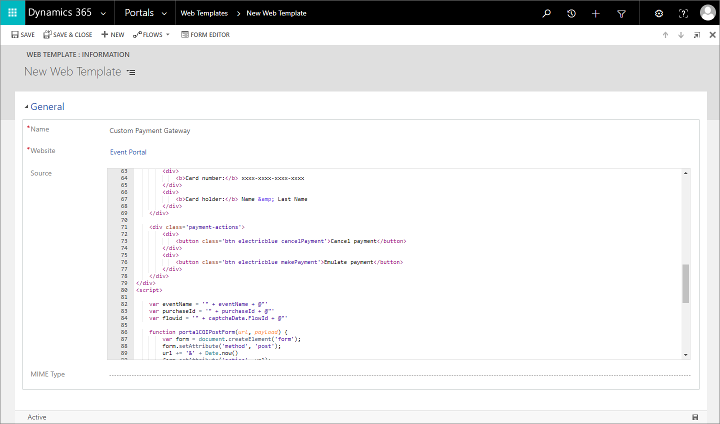 For more information about how to execute custom actions, see Use Web API actions.